Tuber aestivum / uncinatum fruits in almost all European countries, however, there are two varieties of this truffle, the summer truffle (Tuber aestivum var. aestivum), found mainly in Mediterranean climates, especially in Spain, southern France and Italy and the Burgundy truffle ( T. aestivum var. uncinatum) that grows on coller areas from central and north Europe. Without entering into controversy regarding their classification, both species are closely related, showing differences at the level of habitat (colder and more organic soils for T. uncinatum), morphological (darker gleba and ornamentation of the spores more developed in T. uncinatum); and at organoleptic (more taste and pleasant aroma in T. uncinatum) which, likewise, is reflected in the market price for the 2 different varieties, some 50-70 € / kg harvester for T. aestivum and 200 € / kg for T. uncinatum (spanish prices). 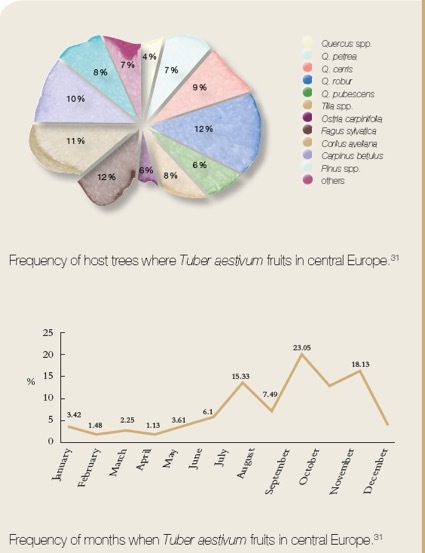 We believed that the mycelium of T. uncinatum produces different successive fruiting throughout the year, a first in April-May to give truffles “aestivum type” of lower quality in summer, and new primordias formed later resulting in truffle harvests of October and November (although you can find until February), more fragrant and higher quality “uncinatum type”. To all this we must add the variation caused by the orientation, altitude and latitude. A higher altitude and further north (cooler and wetter conditions), maturation is delayed. 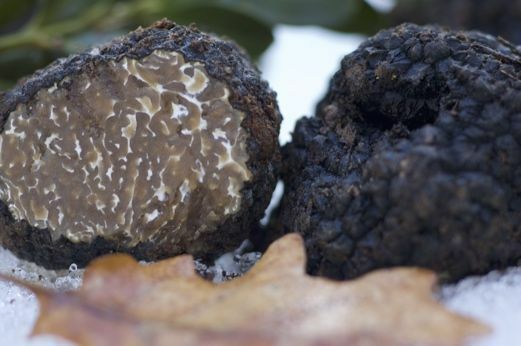 If the above were true, the cycle of fruiting and ripening summer truffle is much shorter than the winter, about 5 months, and perhaps less strict about weather. Truffle say that if it rains in July and August, more summer truffles reach maturity. It is possible that some fructifications can not develop and mature by adverse weather conditions, entering a new dormant until favorable conditions, which could explain the arbitrariness of some collections. Summer truffles also fruit in autumn and occasionally appears mixed with lots of black truffle, ie between November and March, at different stages of maturation. At this time we have found small summer truffles from the beginning of its development, to truffles “aestivum type” with the characteristic white gleba, until “uncinatum type”, with the darker gleba. 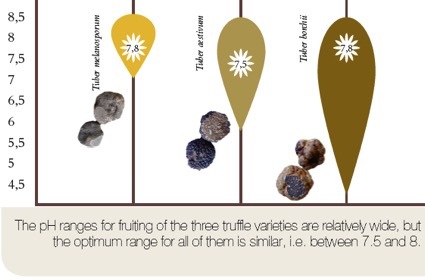 On soil types, the summer and burgundy truffle prefer organic (especially uncinatum) and loamy soils (aestivum type can tolerate higher clay content), but generally share the soil texture of the black truffle. 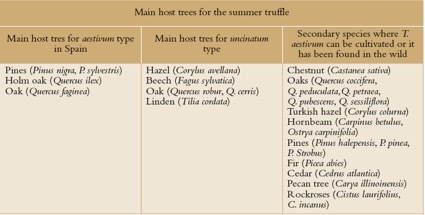 Summer truffle is grown mainly associated with oak and holm oak in Spain and planted at low densities (200-300 trees / ha), while the Burgundy truffle, grows with oak, hazel and pine (nigra and sylvestris), but also lime and cedar, at densities between 600-1000 trees / ha (eg frames in meters 4×3, 5×3 or 5×2). 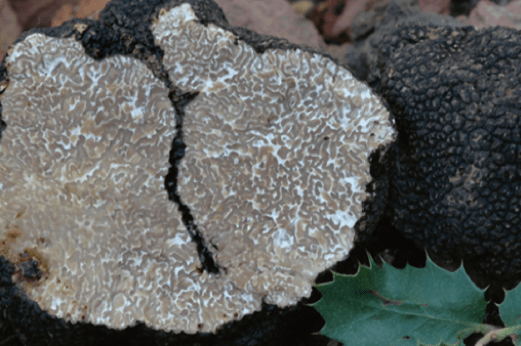 Because the summer truffle is less demanding in terms of weather and ecology, which is reflected in its broad geographical area and the great population genetic diversity, cultivation of summer truffle may have more successful and “easier” than the black truffle.